← Market Timing Brief for 3-28-2013: The Resurrection of the US Stock Market. Or is it? UPDATE for 4-11-2013 @ 2:15 pm: The AAII Survey numbers last night were off the charts Bearish, meaning there are a lot of Bears suddenly at this top. You’ll read in the text below that I felt that the market could sell off if the spread turned negative from the prior data points. It has, but in an extreme way. It is very unlike investors to turn bearish at tops! They do it at bottoms and in fact with a spread of Bulls minus Bears at -35.2% (19.31% Bulls, 54.48% Bears), that matches the sentiment lows in the big sell off in the summer of 2010. We took a huge fall to get there. Since individual investors are often contrary indicators at extremes, the logical conclusion would be that the numbers this week are very bullish, not bearish. Short term, the bearish sentiment may have to work itself out by easing to more positive numbers as the rally convinces more and more investors that the breakout above the 2007 high is real. The caveat is this and it’s an important one: We don’t have data to verify what this very negative spread at a major top means from past data. I even went back to 1987 to check that crash and investors were EXTREMELY bullish at the top. Again, I’ve given you the logical conclusion that this is BULLISH for the market, but I have no other major top to point to when investors were this bearish. Fascinating don’t you think? UPDATE for 4-08-2013 @ 10:10 pm: The S&P500 Index closed at 1563.07, but needs to get above the 3-25-2013 high of 1564.91 to say that the Bulls have fully regained the ball. It’s pretty much like the NCAA championship at half time tonight (1 point for Michigan as I type). The green line from last week’s chart is where the SPX will retop if it makes it above the red line of resistance on the chart (see the SP500Tracker™ link via the link below). The Bears are now on edge, but so are the Bulls with the upcoming earnings. The response to Alcoa was negative for Alcoa (AA), down 1.43% after hours, but OK for the SP500 Index (SPY up 0.16% so clearly not definitive). When the attendant on the elevator used to ask us “Going down?” most of us would answer politely yes or no. When the market starts going down the most frequent reaction of investors is not to say yes or no, but to just not notice or to pretend not to care, but then rush to the TV to see if the Dow (DJI, DIA) is up or down for the day. I am not telling you what to do. I am simply telling you to be conscious about what you do. I also tell you what I’m doing and you may or may not agree with it, but at least you are a more conscious investor and in the end, I believe it will make you a better investor. The tricky part about trading even partially out of the market is of course the issue of whether the market is selling off from a significant top or whether it is simply correcting a bit. If it is the latter, getting out early will result in lost opportunity. If it’s the former, it will result in retained profits and/or capital. We then wait for the market to make some sort of lower low before getting back in and collect the difference on the way back up. It’s less risky than is outright shorting, because with a true short, you lose money while the market rises as opposed to simply missing out on the opportunity, so it’s a double whammy. There is also the issue of having to pay the dividends on the short position. So I coined the term “passive shorting,” which you can read about by Googling it and clicking on the top listing. Then decide what your personal plan will be even if it is to do nothing in what I believe will at least be a correction. Why is this pullback not going to be something much bigger? Because of all the accommodation being done by our Fed. What Bernanke has done “worked,” not in the sense of avoiding future consequences, but in terms of keeping the economy afloat at a time it was going under and then when it remained vulnerable. He has bubbled housing back up a bit and has clearly bubbled stocks up. The next true Bear market, as opposed to a correction, will come as soon as interest rates are steadily rising and/or the Fed hints more strongly about raising rates. They will talk about it before they act on it. So listen to the hints they throw out. If you read between the lines, there are more and more Fed members who are saying that the boom on cheap money will be lowered earlier than the Fed originally thought. In the last new conference, Dr. B. said it would probably take another 3 years for the unemployment rate to get to 6% which is below their target of 6.5% at which point (or with inflation above 2.5%) they would ease off the monetary easing peddle. This week there was noise from some members of the Fed that it could be sooner. Are they simply dissenters or are they seeding the future? The panic in other markets, as in Europe on the Cyprus fiasco, helps the Fed, because they can let those panicking do more of the Treasury (TNX, TYX, TLT, TBT) buying. They can then do less or pile onto panic buying. A strong dollar can also entice foreign investors to U.S. stock markets. Tech (NDX, QQQ) is leading the US stock market down. There is pressure particularly due to the lack of spending by the Federal government on tech due to the sequestration. The NDX (NASDAQ 100 Index) is just barely above the 50 day moving average. The close Friday was below the 3-21-2013 low and below the 2-13-2013 high. Both are negative. I believe the minimum pullback will be to 2703.75, the 1-8-2013 low if the 50 day moving average is broken on a close. Check out the chart here as the Bonus Chart of the Week at the link above. Gold (GLD) completed a market timing reversal this week. 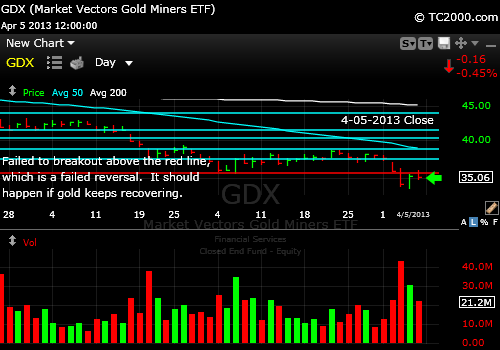 It is now back above the last two lows on the daily chart, which were on 2-20-2013 and on 3-8-2013. Falling back below that first low could be dangerous for gold. The 2012 lows are the last important support and below there is technical trouble. The chart is at the above link. Gold miners still having trouble having failed a breakout on Friday. The thing that looks bad for gold is that its friends in the commodity world are not doing well. The CRB index just broke down significantly. If there is less worldwide demand for commodities, there is deflationary pressure despite the Fed, which is why they started the whole QE program in the first place. Low interest rates did not help Japan get out of its two decade rut and it was not working for us either. What about investor sentiment that has been a pretty good guide lately? The AAII survey of investor sentiment showed that Bulls were down a bit from 38.40% to 35.49% and the Bears were down about a half % to 28.17%. The spread, which is the difference between Bulls and Bears, barely budged from 9.7% to 7.3%, so sentiment is not really in the way of a further rally. But what happened at the last high in 2007? The spread then was at +29% and the Bulls were at 54.64% and the Bears were at 25.77%. We did get to those levels this year on 1-24-2013, but the market actually rallied after that and then gave it back only to rally again to the recent higher high. So obviously that sentiment combination is not predictive of a top for more than a short term trade. What about the other major top? On 3-24-2000 when the SP500 topped, the spread was 46% and the Bulls were at 65.7% and the Bears were at 20%. We are not even close to that sort of stock mania. What I am looking for now to confirm any sort of downside momentum is a shift of the spread to negative spread numbers. I believe that sentiment could start to snowball in a negative way if we get that break below a zero spread. If the spread recovers from here, the Bulls will simply regain the ball after a brief pause. What above the VIX volatility index? It has been sort of stuck in a range right around the critical number I’ve been pointing to which is 13.20. On Friday it closed at 13.92. It failed to break out above 15.40, which needs to happen for the SP500 to break support. I believe we are in for more of a correction in US stocks, which will follow the emerging markets (VWO, EEM) down as discussed previously. Weakness in small caps (RUT, IWM) and banking (BKX, XLF) help to confirm that. Other foreign markets are breaking down too, including the Aussie market. A break in sentiment will convince me that we could gain some downside momentum. A sloppy earnings season that begins on Monday with Alcoa (expected to be strong due to airline demand for planes and auto demand) would aid such a break. If Alcoa sells off based on weak forward earnings predictions that could be the start of the next break of market timing support for the SP500 Index. The Big tech chart hints that tech earnings could be among the worst. This entry was posted in banking stocks, Bonds, emerging markets, gold, gold etf, investment, investor sentiment, large cap stocks, Market timing, mining stocks, S&P 500 Index, small cap stocks, tech stocks, trading, volatility index and tagged aa, aaii survey, CRB Index, emerging markets, gld etf, gold stocks, hui, iwm, market timing, qqq market timing, spx, spy, volatility index. Bookmark the permalink.